Mauritius, an island off the coast of Africa in the Indian Ocean, is known for beautiful beaches, blue lagoons and coral reefs, but it’s not just the coastal areas that draw in more than 1 million visitors from around the world. The interior of the island is home to rainforests, waterfalls, hiking trails and unique animals like the flying fox. Traveling to this island nation is easy and comfortable thanks to its national carrier, Air Mauritius. Not only is the airline a seamless way to bring travelers to the country thanks to convenient connections with codeshare partners, but it’s also a driving force behind the Mauritian economy, particularly that of its tourism sector. Air Mauritius has a Skytrax four-star rating and has also won several World Travel Awards, including Indian Ocean’s Leading Airline 2018, Indian Ocean’s Leading Airline–Business Class 2018, Indian Ocean’s Leading Cabin Crew 2018 and more. A goal of the airline is to transform Mauritius into a strategic hub in the Indian Ocean and the company is focused on developmental strategy and implementing structural reforms. Efficiency has been pegged as one a key area of the airline’s success and therefore the airline has recently modernized its fleet with sleek new planes. Two Airbus 330neo will be delivered at the end of the year, adding to the two new A350-900 that Air Mauritius received last year. In 2019, two more A350-900 will be delivered, and two more will be added in 2023. In the coming months, the cabins of two existing A340 and two A330 will be refurbished to offer a homogenous product throughout the network. Onboard guests will find spacious seating and high-end amenities regardless of their class of ticket. Economy offers modern seats with 31 inches of pitch, and a selection of menu items. With its new A340/A330 aircraft, business class features new generation lie-flat seats with plenty of personal space and massage and lumbar options. Personalized cabin service includes meals that feature Mauritian cuisine, high-end entertainment and music options. Air Mauritius provides in-flight Wi-Fi access on its A350 aircraft, giving guests access to social networks, email and Internet browsing in the sky. Personal entertainment is available on all A330/A340/A350 aircraft. Guests have movie libraries that include Hollywood and Bollywood box office hits, documentaries, children’s movies and more. There is also a broad movie selection and a variety of video games. 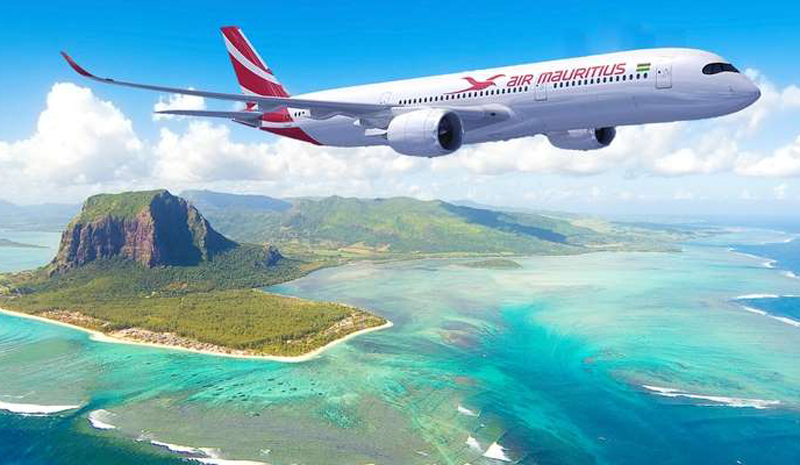 Air Mauritius operates using a hub model, which provides better connectivity through global codeshare agreements with several carriers such as Air France, Emirates, Hong Kong Airlines, South African Airways and more. Through major hubs such as Amsterdam and Paris, the airline provides access to Mauritius from destinations around Europe, including Germany, England, Switzerland, Austria, Norway, Sweden. The airline also offers global connectivity with access through hubs in Asia, Africa and Australia. Mauritius is an excellent destination for travelers looking to experience an alternative to more expensive islands such as Tahiti or the Maldives. There are myriad luxury hotel options as well as unique flora and fauna as well as stunning beaches and excellent tours. It is truly an all-around destination that offers spas, golf, shopping and dining.